If the city is where you belong, the Avenger Street is the sportster you need. Dressed in all the dark shades and with sporty mag wheels, it is guaranteed to set the streets on fire. Be amazed with the easy maneuverability these straight handlebars provide as you tackle narrow streets or long highways, with equal ease. 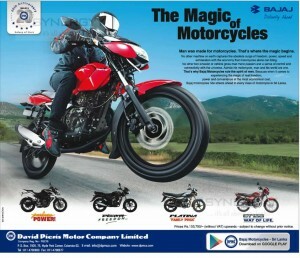 David Pieris Motor Company Ltd.
David Pier is Motor Company Limited (DPMC), has launched the Avenger STREET 150 for cruiser aficionados in Sri Lanka. Cruiser motorcycles have defined the American riding culture with their distinctive styling and powerful sound, as well as the upright riding position. Typical cruiser enthusiasts have historically customized their bikes to suit their individual preferences, resulting in wide variations in styling, as well as the performance of the bikes themselves. With its unique cruiser styling, longer wheelbase, wide handlebars and comfortable, upright riding posture, the Avenger STREET 150 provides the ideal choice for those who desire a motorbike that combines power and maneuverability, with comfort and unique styling. Due to its healthy power-to-weight ratio, the Avenger STREET 150 feels equally at ease on city streets or cruising down byways. The Avenger STREET 150’s five-speed gear system feels smooth to use, with a light and progressive clutch action, The 150cc DTS-i engine translates into more power, better performance and lower emissions. 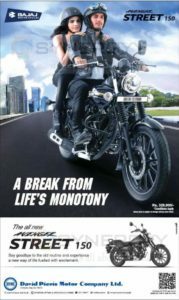 Avenger STREET 150 also comes with 17-inch front tyres with 130mm section and 15-inch tyres at the rear, both with black alloys. The longer front shock absorbers are telescopic and anti-friction, while the dual-spring suspension setup at the rear provides a comfortable ride. The 14-litre fuel tank can carry sufficient fuel for long rides. Avenger STREET 150 also packs in extra features such as white hue headlamps for better visibility for night riding, semi digital meter console with speedometer. The comfortable foam padded seating, with an elevated rear seat, adds to the feeling of a real cruiser. 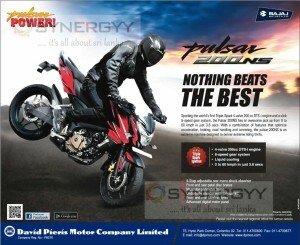 David Pieris Motor Company Ltd brings you a Bajaj Pulsar US 150 known for Power to Play Harder. Bajaj Pulsar US 150 comes with 17PS Powered 4 valve 150cc DTS-i Engine, Which gives you ultimate performance at any tough time. 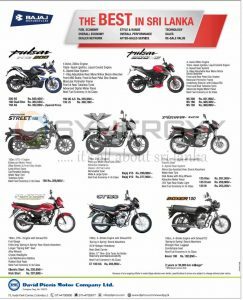 Bajaj Pulsar US 150 not only know for power but also for the style and performance with latest features of petal disc brake, perimeter frame, nitrox mono shock absorber, tubeless tyres, advanced exhaust, naked street looks, digital meter console, 10 spoke alloy wheels. There is a huge expectation from threewheel driver about the price reduction of three wheeler after the budget implementation. But the reality was the tax reduction of 15% was reducing only for motor vehicles which less than 1000cc. 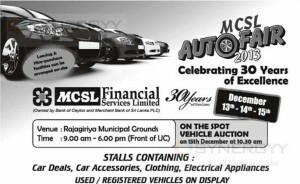 This tax reduction has not impact to any of three wheeler or motor cycle prices in Sri Lanka. 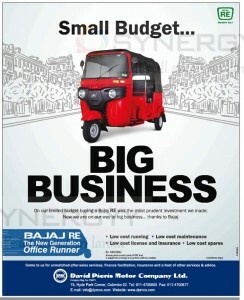 The Brand New Bajaj Three wheeler (Auto) will be Rs. 492,380.00 all Inclusive. 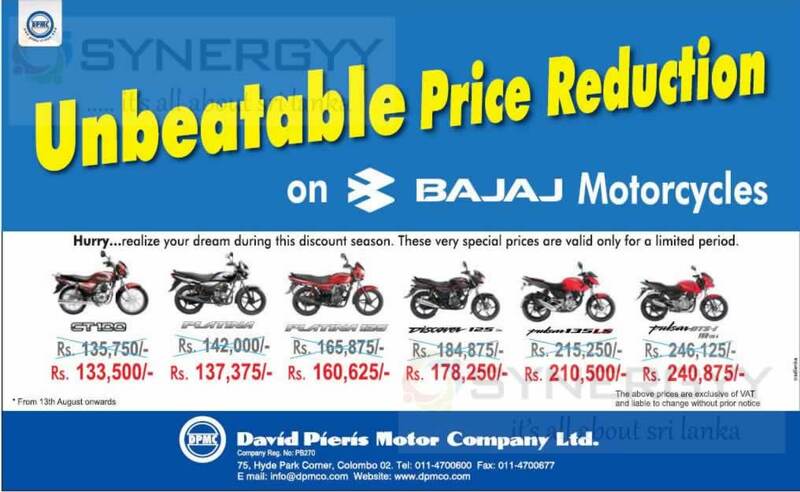 David Pieris Motor Company Limited announces a special promotion for Bajaj Discover 125 Motor Cycle in Sri Lanka, prices starting from Rs. 250,900/-. The new Discover 125 is equipped with an enhanced 4 valve DTS-i Engine, that delivers exhilarating power with exceptional fuel efficiency. Also added are a host of new features that makes every ride exciting. 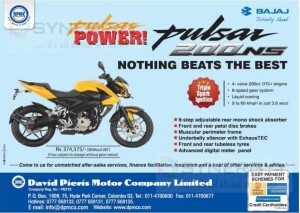 Sporting the world’s first Triple-Spark 4-valve 200 cc DTS-i engine and a slick 6-speed gear system, the Pulsar 200NS has an awesome pick up from 0 to 60 kmph in just 3.6 secs. With a combination of features that optimize acceleration, braking, road handling and cornering, the pulsar 200NS is an extreme machine designed to deliver extreme riding thrills. 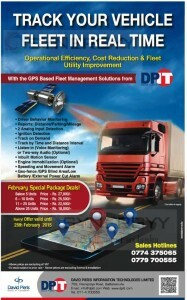 Please visit the nearest regional office for further details at 75, Hyde Park Corner, Colombo 02. 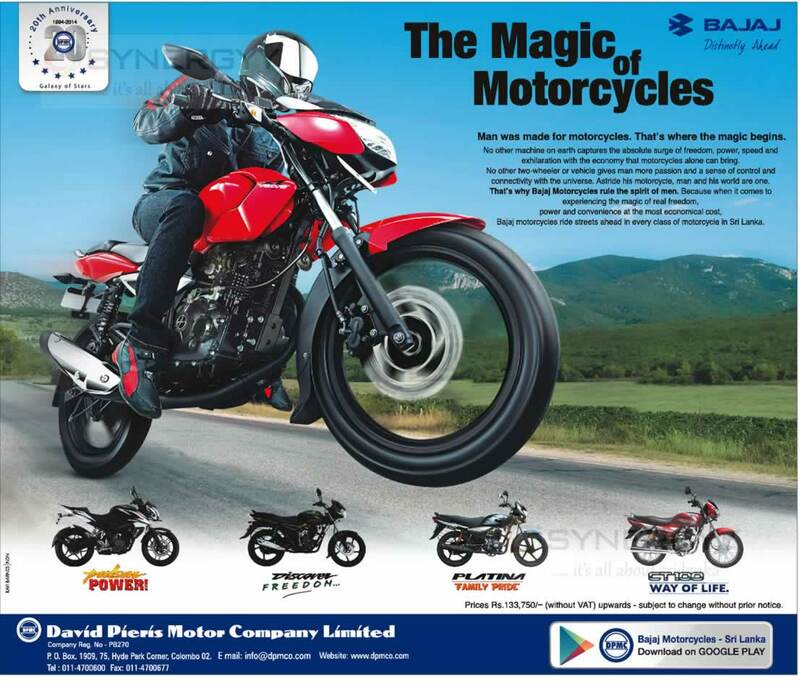 David Pieris Motor Company Ltd in Srilanka an sole agent of Bajaj Automobiles of Motor Bikes and Three Wheelers in Srilanka. 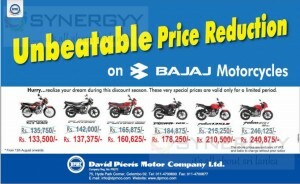 Announces its current Price of Bajaj Three Wheeler Prices as Rs. 492,380.00 All Inclusive, invest on your small budget and maximise your value of your personal and business venture. For more details about the instalment and availability of three wheeler contact to David Pieris Motor Company Ltd.
75, Hyde Park Corner, Colombo 02. 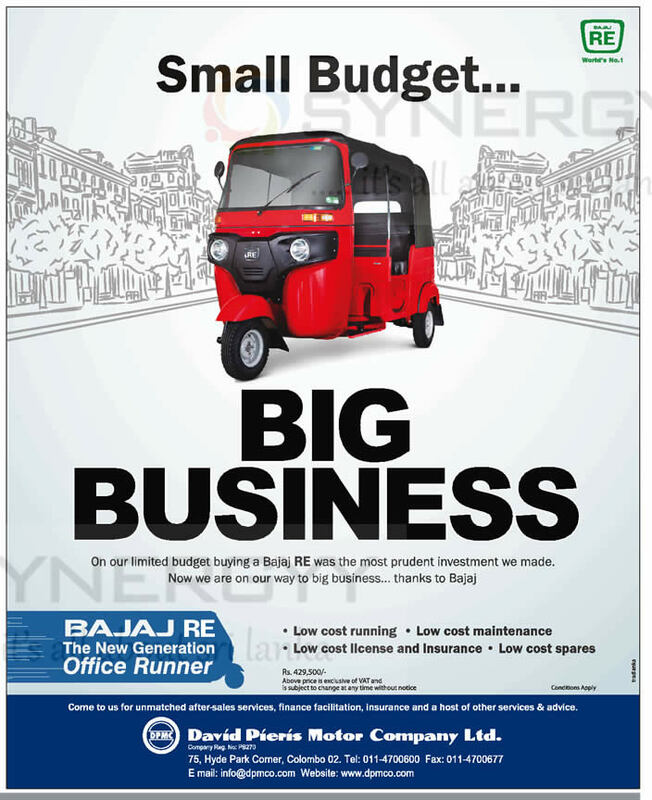 The Bajaj three-wheeler, a familiar sight on the roads of Sri Lanka and the number one vehicle in the three-wheeler market is being re-launched with revolutionary upgrades and changes to fulfil the aspirations of customers. 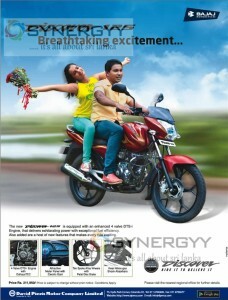 The new Bajaj RE Three Wheeler boasts of several world-class features. Foremost among these is its Twin -Spark engine. This Twin-Spark engine gives the Bajaj RE Three Wheeler unmatched power and pickup, allowing the vehicle to zoom ahead of the traffic, leaving the rest behind. With this new vehicle, drivers will be able to make more trips in the same time, and carry heavier loads too. This low-maintenance engine also burns fuel more efficiently, thereby giving more mileage and reducing fuel costs. This also leads to less maintenance of the engine. 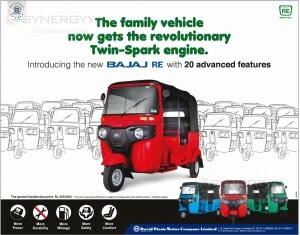 There’s a lot more new and improved features in the new Bajaj RE Three Wheeler. The modern, easy-to-use, high-tech hydraulic brake system makes it so easy to operate, improving safety during driving. The new twin headlight system gives a brighter, broader light beam which travels further, improving visibility at night and making night driving so much easier and safer. The additional leg space in front also makes driving so much easier and the comfortable seat reduces fatigue during long trips. The improved finish of the spacious backseat offers passengers a high degree of comfort during the ride. In addition to these, the improved large clutch plate increases durability, making it unnecessary for frequent clutch changes. Complete with all these upgrades and new features, the Bajaj RE Three Wheeler with its ultra modern DTS-i and Exhaus-TEC technology can travel further with more power, more durability, more mileage, more safety and more comfort. 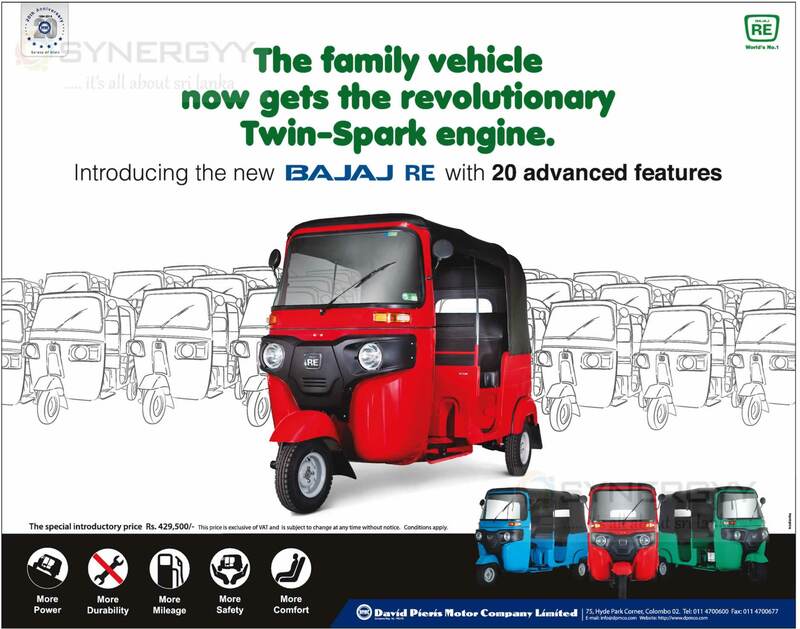 The new Bajaj RE Three Wheeler, with its attractive and superior design and improved features, is now in the forefront as today’s No1 family vehicle.